Rinse the black walnuts, if you harvested them yourself. Fill a quart Mason jar half full with potato vodka. 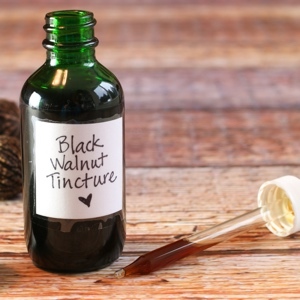 This will draw the medicinal properties from the black walnut. Slice as much skin off the walnut as you can before getting to the pit. It's rather like cutting up an unripe mango -- you keep going until the middle, fleshy part is too difficult to slice through. Place each slice of walnut directly into the potato vodka or it will oxidize. Repeat the process until the Mason jar is as full as you'd like. Make sure the hulls are completely submerged in vodka. Seal the jar and store in a dark place for about 6 weeks, checking it from time to time by shaking it. The liquid should be dark green, not completely black. After 6 weeks, strain liquid into a dark glass jar (preferably amber-colored), and keep in a dark place.